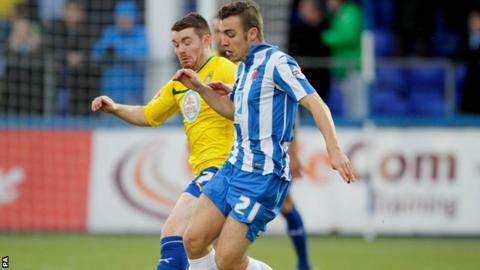 Hartlepool manager Colin Cooper says the impact full-back Michael Duckworth has had since joining is an example of the talent playing non-league football. The 21-year-old in August and has made 16 starts in League Two. In 2008, Fulham signed Chris Smalling from Maidstone - a club in England's seventh tier. Within three years he had won the Premier League with Manchester United. "Michael's been an absolute revelation for us," Cooper told BBC Tees. "There will be other gems at that level, but often the problem is that we can't offer a salary to justify the risk of them quitting their day job." Duckworth began his career with the York City academy but failed to win a full-time deal. He then moved on to Harrogate Railway and Park Avenue before being offered an extended trial with Hartlepool and ultimately securing a professional contract. "It was more by luck that we found Michael if I'm totally honest. I knew his manager at Bradford and he asked me to take a look at him," Cooper explained. "Because he is young, he didn't have the kind of tough decisions that some non-league players have. "If you have a family, security is everything. If signing a contract means earning less than having a full-time job, and playing part-time it's too risky."